Rheumatoid arthritis is a disease that affects all of the synovial joints in the body. The cervical spine contains synovial joints. The destruction caused by the rheumatoid disease process affects different regions of the cervical spine. For the patient with rheumatoid arthritis, the effects of the arthritis on the cervical spine can vary from minimal symptoms to life threatening pressure on the spinal cord that requires complex surgery to stabilize the spine and reduce the pressure on the spinal cord. What parts make up the spine and neck? The spine is made of a column of bones. Each bone, or vertebra, is formed by a round block of bone, called a vertebral body. A bony ring attaches to the back of the vertebral body, forming a canal. This bony ring is formed by two sets of bones. One set, the pedicle bones, attaches to the back of each vertebral body. A lamina bone connects to the other end of the pedicle, one on the left and one on the right. The lamina bones form a protective roof over the back of the spinal cord. When the vertebra bones are stacked on top of each other, the canal forms a long tube that surrounds and protects the spinal cord as it passes through the spine. An intervertebral disc fits between each vertebral body and provides a space between the spine bones. The disc works like a shock absorber. Between each two vertebra are two synovial joints called facet joints. Together with the disc, these joints connect the two vertebra together and allow motion at each level of the spine. The first two cervical vertebrae are very specialized to allow us to turn our head from side to side. The first cervical vertebra (or C1) is called the atlas. The second cervical vertebra (C2) is called the axis. The C1 vertebra connects the skull to the cervical spine. Between C1 and the skull are synovial joints. The C1 vertebra is formed like a ring that sits on top of C2. The C2 vertebra has a bony knob that fits into the front portion of the ring of the C1 vertebra. This bony knob is called the odontoid process. It is held in place by a special ligament that holds it tightly to the front of the ring of the C1 vertebra. The spinal cord enters the skull through a hole in the base of the skull called the foramen magnum. Two blood vessels also enter the foramen magnum, one on the left and one on the right. These blood vessels, called the vertebral arteries, supply the back portion of the brain. Like each spinal segment, between the C1 vertebra and the C2 vertebra there are a pair of synovial joints–one on each side of the spinal canal. Rheumatoid arthritis is a disease that causes destruction of synovial joints. The problems that arise in the neck are primarily due to this destruction of the synovial joints. As the joints are destroyed, the connection between each vertebra becomes unstable. The upper vertebra is able to slide forward on top of the one below. This slippage is called spondylolisthesis. In the lower part of the neck below C2 this can lead to pressure on the nerve roots and the spinal cord. 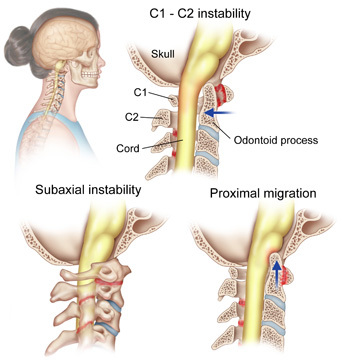 This problem of instability is most dramatic between the C1 and C2 vertebrae. As the facet joints and the ligaments that hold the odontoid firmly in the front of the ring formed by the C1 vertebra are destroyed, the C1 vertebra is able to slide forward. If this instability becomes too great the odontoid may start to push into the spinal cord. This can lead to problems from too much pressure on the spinal cord. The connection between the skull and the C1 vertebra may become unstable as well. The destruction of the joints between the skull and the C1 vertebra allows the skull to “settle.” When this occurs the bony knob of the C2 vertebra (the odontoid) begins to move upward into the skull and can put pressure on the spinal cord as it leaves the skull through an opening called the foramen magnum. The two vertebral arteries also enter the skull through this opening and may also be compressed by the odontoid. The symptoms of rheumatoid arthritis in the cervical spine are extremely varied. Pain is the earliest symptom and may be part of the overall joint inflammation that occurs with the arthritis. As the disease progresses, the symptoms that are most worrisome are those that suggest that the spinal cord is being affected. Pain at the base of the skull is common and can indicate that the nerves that exit the skull and the upper spine are being irritated or compressed. Pressure on the vertebral arteries can lead to blackout spells when the blood flow through these arteries is diminished with certain movements of the head and neck. A change in the ability to walk can signal increasing pressure on the spinal cord. In some cases this can be a spastic gait with weakness and problems with balance. This is an indication that the spinal cord is being compressed. Any change in the ability to walk should be brought to the attention of your doctor. Feelings of tingling, weakness, or a loss of coordination can affect the arms or legs. Changes in bowel or bladder control such as incontinence or inability to urinate can also occur. Because the area of the spinal cord that is being affected is so high up, the changes in strength, balance, and sensation may vary and be difficult to interpret. The diagnosis of rheumatoid cervical spine problems begins with a thorough history and physical examination. You doctor will want to know about changes in your ability to walk and get around especially if this has gotten worse rapidly. Changes in your bowel or bladder function are also important. Any neurological symptoms that have changed such as weakness, numbness, or loss of fine motor skills are important. An important part of evaluating the neck includes X-ray of the cervical spine. This may include special X-rays where you are asked to bend your head forward as far as possible and back as far as possible. These are called flexion and extension X-rays and can show how much instability is present between the vertebrae of the neck. The MRI scan is the most important test for showing the nerves and soft tissues of the cervical spine. This test uses magnetic waves to create slices through the spine. Using this test, the degree of compression on the spinal cord can be assessed more accurately than with X-rays alone. Finally, special electrical tests may be ordered by your doctor and performed by a neurologist. These tests are useful to determine how the spinal cord is functioning. The primary nonsurgical treatment of the cervical spine problems associated with rheumatoid arthritis begins with good medical control of the rheumatoid arthritis. This treatment is normally managed by a specialist in rheumatology rather than the spine surgeon. Within the past several years, there have been significant advances in the development of new medications that can control the destructive effects of the arthritis on the joints. Your rheumatologist will manage these medications. Once there is evidence that the rheumatoid arthritis has affected the stability of the cervical spine, the most important part of spine care is close followup. X-rays may be needed from time to time to assess the degree of instability and follow the progression of the disease. Mild instability with no evidence that the instability is causing any pressure on the nerves or spinal cord may not require any additional treatment. 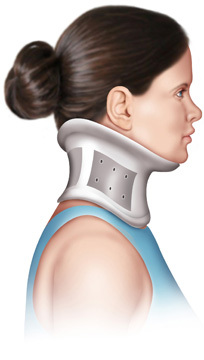 Patients with X-ray signs of instability may need to protect their neck with a special neck brace, especially when riding in a car. This is mainly to prevent damage to the spinal cord should a cervical spine injury occur. When signs of pressure on the spinal cord become apparent, many surgeons feel that surgical stabilization should be considered. The goal of surgery is to stabilize the unstable portion of the cervical spine, to remove pressure from the spinal cord and to relieve the pain caused by the underlying instability. When two or more vertebrae are stabilized, however, available movement in the neck is reduced. For example, rotating the neck from side to side occurs mainly between C1 and C2. 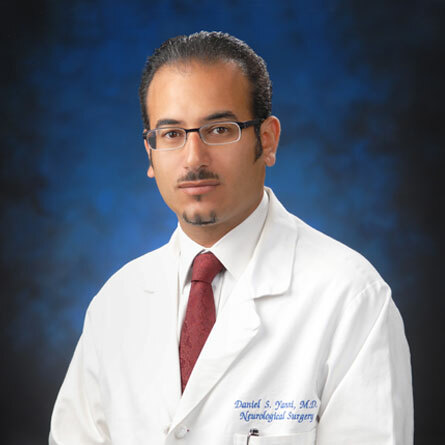 Surgery that joins C1 and C2 together reduces neck rotation up to 50 percent. Posterior cervical fusion (described below) stops all forward and backward motion between the fused vertebrae. The decision when to operate should be made based on your symptoms, your expectations, and your overall medical condition. These operations are extremely complex and carry significant risks that need to be taken into consideration. When the instability involves the lower cervical spine (C3 to the bottom of the cervical spine) a posterior fusion is usually preferred. A fusion of the spine is also called an arthrodesis. In this type of operation, the surfaces of the vertebrae to be fused are roughened to create fresh bleeding bone. Bone graft taken from the hip is then placed between and across the back of the vertebrae to be fused. These vertebrae are held together with some type of hardware, called instrumentation. Many surgeons feel this may increase the success rate of the fusion and also may reduce the need for the more cumbersome external braces. The traditional way of holding the vertebrae together is to wrap wire around the spinous processes of the vertebrae to be fused. (The spinous process is the bony bump on the back surface of the vertebra.) This holds the vertebra in place while the bone graft heals fusing the vertebra into a solid block of bone. When the primary problem is instability between the C1 and C2 vertebrae, a fusion between these two spine bones is usually recommended. The traditional method of fusing these two vertebrae is to place wedges of bone graft between the two vertebrae and then to wire the two vertebrae together. Fusion causes the two vertebrae to form a single bone. The goal is to stop the progression of the instability and relieve the pressure on the spinal cord. Perhaps the most serious condition from rheumatoid arthritis of the cervical spine is the settling that occurs when the joints between the skull, the C1 vertebra, and the C2 vertebra are destroyed. Settling allows the odontoid to slowly place more pressure on the spinal cord and brain stem and can lead to paralysis and even sudden death. The surgical procedure to stabilize this situation requires a fusion between the skull and the first three cervical vertebrae (C1, C2, and C3). The traditional procedure to fuse these bones together is very complex. Bone graft is taken from the pelvis and fashioned into two small plates of bone that will cover the area from the base of the skull to the C3 vertebra. In advanced cases, the pressure may need to be relieved from the spinal cord. The surgeon may do this by removing a portion of the skull and the back portion of the C1 vertebra. In select cases, the surgeon may need to work on the front of the spine by operating through the mouth, called a transoral approach (see below). When all pressure is removed from the spinal cord, the bone graft is placed. Small holes are drilled into the skull and first three cervical vertebrae. Wire is inserted through the holes in order to hold the graft in place. Recently, instrumentation has been developed to hold the bones and bone graft in place while the bones fuse. Several different types of metal rods and metal plates have been developed that can hold the skull and upper cervical vertebra together while the fusion heals. Many spine surgeons feel that these newer techniques and instrumentation will increase the success rates of these types of fusions. As the bone graft heals, the first three cervical vertebrae fuse to the skull. A successful fusion stops the instability and protects the spinal cord from additional pressure. These posterior fusion operations are all performed through an incision in the back of the neck. The fusion usually takes at least 12 weeks to become solid, but it may take as long as one year. In some cases of advanced rheumatoid arthritis of the cervical spine, the posterior fusion alone is not enough to take the pressure off of the spinal cord. This can occur in two ways. First, the cranial settling may be so great that a fusion cannot remove the pressure that the odontoid is placing on the spinal cord. Second, the pannus that occurs due to the rheumatoid disease may put pressure on the spinal cord. Pannus is formed by most joints afflicted with rheumatoid arthritis. This material is formed by the synovium (or the joint lining) and grows and expands like a tumor. As it grows larger it can put pressure on the spinal cord. Usually, once a fusion has been successful the pannus actually shrinks, and the pressure on the spinal cord is reduced. If either of these conditions is causing too much pressure on the spinal cord, a second operation may be needed to remove the pressure on the spinal cord. Because the pressure is on the front of the spine and spinal cord, the operation must also be done from the front of the spine. When surgery on the front of the spine is necessary in the upper cervical spine it must be performed through the back of the mouth. This is called a transoral approach (“transoral” means through the mouth). The operation begins with the transoral approach when it is certain that pressure must be removed from the front of the spinal cord. This is followed by a posterior fusion during the same operation. In some cases, the posterior fusion may be done alone at first to see if this reduces the pressure. If the posterior fusion alone is not successful, a second operation using the transoral approach may be done at a later date to remove the continuing pressure on the spinal cord. During the transoral approach, the surgeon makes an incision in the back of the throat while the mouth is held open with special retractors. The source of compression is identified and removed to reduce the pressure on the spinal cord. Surgeons do the operation with the aid of an operating microscope to be able to see the incision better.